Wow. These books . . . they need to be on my shelf. Like I am starting to glance at my calendar and mumble about how many months left in the year. Not only have they all three been on my must-have list for some time now, but they got themselves such fantastically pretty covers to boot. Way to go, little books! Way to stand up for yourselves and demand the eye-catching treatment. Now why do you have to go and be out next year?! This is the second novel from Ms. Lindner. After falling utterly in love with Jane, her contemporary retelling of Jane Eyre, I was signed on for life. But knowing that her sophomore novel is a contemporary retelling of Wuthering Heights sort of nudges me over into supreme fangirl territory. How will she update that bit of insanity? I can't wait to find out. Love the idea, love the cover, love everything. 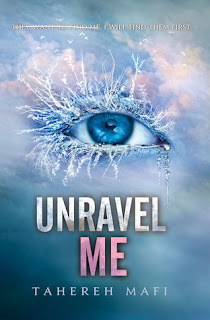 I'm incredibly pleased with the cover revamping that went on with the paperback of Shatter Me, and very happy the cover of the sequel will match it. I know people really went one way or the other with Ms. Mafi's first book, but I am firmly in the excited for the next one camp. It will have Warner in it, yes? Then everything's gonna be CRAZYTOWN. I approve of this entirely. This one is a new-to-me author, though I'm familiar with her online presence. I would have been happy without the couple on this cover, as I'm digging the rusty, dusty clouds and the clean, clear font. But I'm not opposed to the romantic touch the floating pair add and hope it bodes well for what's inside, which by all accounts includes sylph guardians, musical weapons, and general storminess. hmm Catherine does look interesting! Amy, yeah. You know she's gonna play around with it some, and I like the whole underground musicians/told from two perspectives 20 years apart thing . . . I don't think I'm going to pick up Unravel Me. But! I am excited about Catherine, (even though it is spelled with a C which is just so smug). And I got Let the Sky Fall at Simon and Schuster and can't wait to start it! I haven't even read Jane, yet. Though I do love the original Bronte! They should totally make these into movies, too. Love the contemporary twists on old classics! Sharry, ooh. Read it. Read it now! 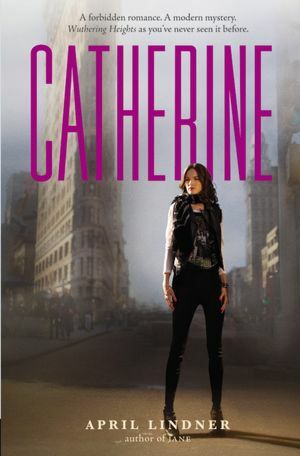 I'm a bit nervous about "Catherine" because I don't like "Wuthering Heights", but I still plan to get the book because I thought that "Jane" was pretty good. Sabrina, yeah, I hear ya there. But I've had good response from people who didn't like JANE EYRE liking JANE quite a bit. So maybe the same will be true for CATHERINE. Here's hoping! Sandy, it's not a tale for the faint of heart. That's for sure. I do love huge chunks of it. But it's definitely an acquired taste. Isn't the new cover style so much better for the Mafi books? So much better. Mafi's books don't appeal to me, but I love the covers so much. Livi, yes, that caught my eye immediately as well. Yeah, Mafi's style is so specific that it's never gonna appeal to everyone. Which is just fine. JANE was fabulous; I don't like WUTHERING HEIGHTS, so I'm skipping out on CATHERINE, though. 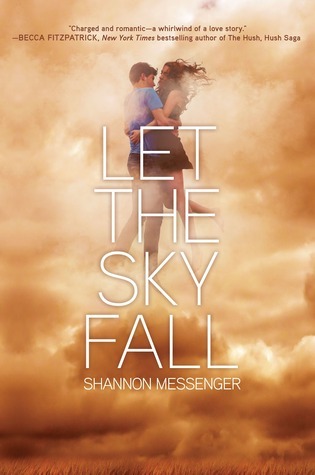 The cover for LET THE SKY FALL is b-e-a-utiful. Nic, it really was fab. And such a good reread, too. Oh fantastic! I've been wondering how Jane was, because I've had my eye on both it and Catherine...the fact that you fell utterly in love has me convinced I must! 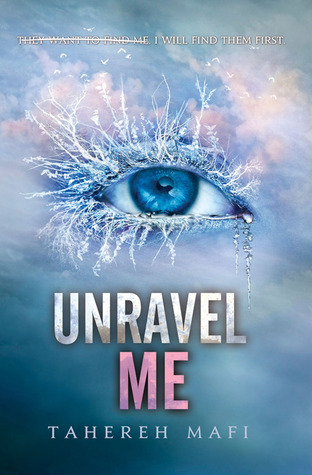 I haven't read Shatter Me yet either, but I'm all about the cover revamp. That alone makes it a more appealing read to me. I picked up Shannon Messenger's forthcoming MG at BEA, if that's a win, I'll probably check out Let the Sky Fall as well! Heidi, read it, read it, read it. Can you hear that? It's the sound of JANE calling your name . . .
Yeah, SHATTER ME's original cover was just so lame in so many ways. These are much to be preferred. Let me know about the MG. I is curious. Oh wow, Catherine looks gorgeous! Thanks for the heads up on that, adding it to the Goodreads wishlist now. I'm not a fan of Wuthering Heights but Jane was wonderful so I'm still planning to check out April Lindner's next novel. Chach, doesn't it? I love what they came up with and how it matches JANE. Picturing them next to each other on my shelf makes me a happy camper indeed. Hmm. I enjoyed Lindner's JANE, and I'll take a look at CATHERINE, even though I'm not a fan of WUTHERING HEIGHTS. I'm looking forward to LET THE SKY FALL. Keertana, I agree. Very interested to read it. Definitely give JANE a go sometime. It knocked my socks off. I really LOVE the cover Catherine and can't wait to see what's up April Linder's sleeve! April, oh boy oh boy, am I stoked for that one! wow the Let the Sky Fall cover is totally gorgeous, and a new-to-me author and title. color me intrigued! Charlotte, oh good! Another one for the TBR. It really is lovely, isn't it? Shannon, thanks for stopping by! Happy to feature such a lovely. Can't wait to read it. I really enjoyed Jane too so I'm definitely going to read Catherine. Haven't heard about Let the Sky Fall before so I'll have to look into it. These all have really beautiful covers. I'm really looking forward to all of these. Too bad they all come out 2013!